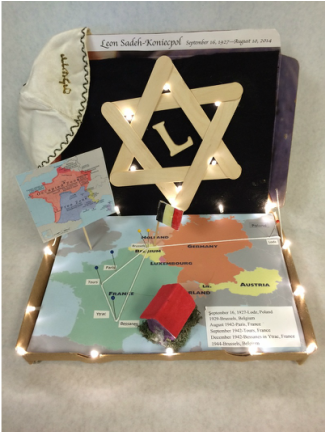 Leon Sadeh-Koniecpol was Jewish, so this shadow box includes the Star of David, and a kippah. The map is meant to represent his journey traveling across the French border during World War II. My grandfather always liked to recount his stories, routes, and his stay at a farm in Bessanes, France; I represent all those also in there. On the side of my box, three images pop out; they are my grandfather’s fake ID’s that he used during the war. It is decorated with some lights to make it look like a memorial. In December 1944, a seventeen year old man named Leon Koniecpol stepped off the train in Brussels, after a long trip back from Auvergne, a region in the south of France where he had lived in hiding for two years. His parents had stayed behind, and he had not seen them since that fateful day in mid-August 1942 when they had told him and his sister, Nicole, that they had to leave their home to try to cross into the part of France not yet occupied by the Germans. On that day in December 1944, the German army had just been chased away by the Allied troops and were retreating to Germany. When my grandfather arrived at his old home, his mother opened the door but did not recognize him. He had left a young teenager and had returned a grown man hardened by two years away from his family. Jewish people were asked to report to places from which they were sent to concentration camps. He was caught shortly after crossing into France Libre and was sent to several French labor camps for children. He was still fifteen at the time, and the French did not realize he was Jewish.Leon was traveling with fake papers from Belgium hiding his real identity and the fact that he was Jewish. Eventually, Leon, my grandfather, found a way to escape and went to work on a farm in the middle of Cantal, which was a region in the middle of France with very few people. He told my dad that the farm where he worked was so far from anything else that even though the Germans occupied France, the German soldiers never came to the farm where he was hiding.He also recounts how his sister’s husband, Ady, joined the “resistance.” The resistance was a group of people who took arms in occupied France to fight the Germans. He later got arrested and sent to a concentration camp, where he was killed. His sister (Aunt Nicole) was pregnant at the time and returned to Brussels to give birth to my father’s cousin, Roseline. Roseline never knew her father and was actually left in a convent for a year until the Germans had left Belgium and it was safe for my Aunt to get her daughter back. By the spring of 1942, preparations by the Germans to gather all Jews living in Belgium and ship them to concentration camps began. A number of young Jews had already been rounded up by the Germans to help build and reinforce parts of the “Atlantic Wall.” This was the wall built by the Germans along the Atlantic Ocean to protect themselves against a possible invasion from the Allies - including the UK and US. Leon did not know exactly everything that was happening, but news of harsh treatment began to spread among the Jewish people. There was a general sense that things were only going to get worse. From the beginning of the summer, his parents left their home with him, and went into hiding at the home of some close friends who were living in Anderlecht, another neighborhood in Brussels.The family ended up in a house on the same street where the owners had agreed to rent them a very sparsely furnished attic. It had no thermal insulation and left them exposed to the elements. There, the family remained confined all day long with almost no contact with the outside. The first floor tenants understood their situation, and tried to make them feel as comfortable as possible. Thehe other two families living in the building were more reserved but did not appear to be very hostile. As time went on, Leon and his family would learn to benefit from the sympathy of this little world. At night, Leon began to speak aloud; sometimes even cry. His parents were concerned that this might wake up the neighbors and eventually lead to someone reporting the whole family to the authorities. Despite all the risks, Leon’s parents made the difficult decision to send him and his sister off in hope that this time we would be able to cross into Free France. The last major hurdle before shipping him off was making sure that he had a fake ID. Leon was not quite fifteen yet, but children fifteen and older were required to carry an ID. So, his parents found someone who aged him by a month. On his fake ID, instead of being Leon KONIECPOL, he had become WAUTERS Leon, Albert - born August , 16 1927 instead of his real birth date of September 16, 1927. My grandfather and his sister went on to Paris where they met their cousin, Betty. Together it took them another three weeks to prepare for their journey and make contact with a man Nicole had met in prison. By late September, they went on and reached the city of Tours, which was located near the border to Free France. Soon after passing the border and spending their first night in Free France they were arrested by French agents working for the Vichy government. The Vichy government was the government of Free France and was collaborating with the Germans, often arresting Jewish people too and sending them to camps. My grandfather and his sister were each sent to separate camps. Between September 1942 and December 1942, my grandfather was moved to three or four different French labor camps. Eventually, he was able to sneak out and find a farm in a tiny hamlet in the middle of nowhere called Bessanes. There he spent the next two years working as a farm-hand under his fake identity. The farmers had no idea he was Jewish. He worked under harsh conditions and slept for two years in a barn, with no heating, no running water and no electricity. The farmers came to appreciate him for his hard work, and at the end of the war, when the German army had retreated, he revealed to them that he was actually Jewish. They never believed him, as they thought that all Jews looked like the caricatures, and other stereotypical drawings they had seen in newspapers. Over a period of several weeks, my grandfather made his way back to Brussels, where he arrived just as the German army was retreating. My grandfather later moved to Israel in 1949 where he joined the army and became an Israeli officer. He then changed his name again to Leon Sadeh-Koniecpol. After seven years in Israel, he returned to Belgium: his dad was in bad health and died a few months after Papy returned to Belgium. This happened in 1956. He spent the rest of his life in Belgium, helping his mother and sister. He met Mamie, my grandmother, and they married in 1961. My dad was born in 1962. He never moved to the U.S., but my dad did in 1985. Papy and Mamie came to visit him in the U.S. a number of times, but they continued to live in Belgium.